Teachers and parents of teens, I have a treat for you! I recently joined NetGalley and fell down the incredible rabbit hole of free books. Free books just to read and review! I got a little overly excited, which I have since learned is common for a NetGalley newbie. But, I wanted to read them all! Give me all the books! 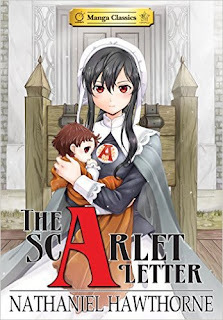 Imagine my silly delight when I stumbled across a Manga Classics version of Nathaniel Hawthorne’s class, The Scarlet Letter. As a huge fan of this novel (as a reader and a former teacher), I could not pass this opportunity up. Now, now. I know there are always the purists, but I think the purists need to chill out. Kids need to see the classics in a form they can appreciate. And, for many students, this form is manga. Am I saying this manga edition is a replacement for The Scarlet Letter? Absolutely not. The problem with manga editions or graphic novel editions of any classic works are that the beauty of the language is simply not there. The reason Hawthorne and Dickens and Austen stand the test of time is because of the words they used to tell their stories. A manga is not made to incorporate lengthy sentences or sophisticated vocabulary. However, the benefit of adding this manga edition of the classic work to your library is that it is a great supplemental tool for teaching the plot, characters and symbolism. Even with most of the words stripped away, the plot is still clear. The characters are illustrated well. And symbolism is expressed with art. I could see using this material for an additional resource while I was teaching high school easily. Will students be able to write an essay or pass a test by reading this edition? No. Will they possibly enjoy the story more by reading it alongside the assigned text. Yes. Give it a try!